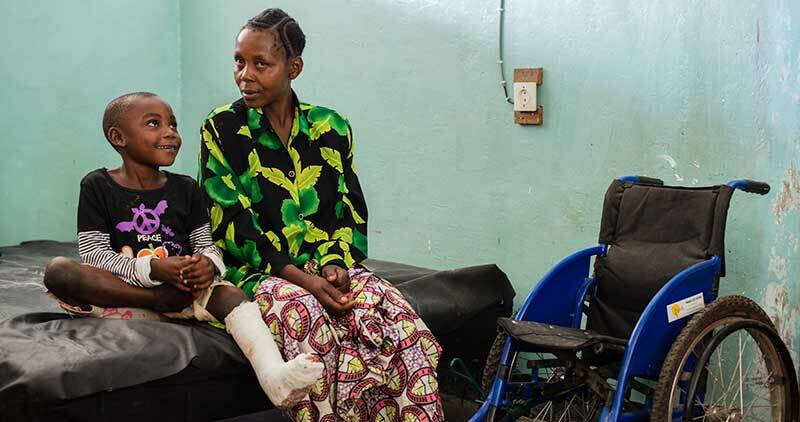 Pascal 6, with his mother Riziki, two days after his club foot surgery in hospital. I met Pascal just outside Kirotshe Hospital, located four kilometres south of his village. As his mum, Riziki approached me, I could see how tired she was. She had carried her son on her back for the entire trip. I found out that every day since Pascal was born, Riziki had carried him on her back. This was how he got around. Six years ago, shortly after Pascal was born, Riziki knew something was wrong. She told me that only four days after giving birth, she noticed one of his legs was weak. When she brought Pascal home, he couldn’t move his leg at all. Pascal was born with clubfoot, a condition that caused his left foot to turn inward at the ankle. Because of his club foot, Pascal couldn’t walk. He’s never been to school. At home, he’d crawl on the rough ground, on his hands and knees. When I asked Riziki what she wanted for her son, she told me she wanted Pascal to be able to walk, and go to school. But she couldn’t even afford to send her son to school. You see, before she had Pascal, Riziki worked as a fish seller. But after he was born she had to give up her job and devote most of her time and energy to caring for him. Riziki couldn’t leave Pascal with anyone to go and find work. She told me that he used to crawl to neighbours’ houses to play with the children. But because he couldn’t walk, he’d often soil himself before he reached the toilet. The neighbours would throw him out in disgust. Pascal always crawled home in tears.